In 1971, the American Academy of Orthopaedic Surgeons (AAOS) published the first edition of Emergency Care and Transportation of the Sick and Injured and laid the foundation of EMS training. Today, the Eleventh Edition transforms how EMS education is delivered throughout the world and helps develop world-class EMS providers around the globe. Based on the National EMS Education Standards and the 2015 CPR/ECC Guidelines, the Eleventh Edition offers complete coverage of every competency statement with clarity and precision in a concise format that ensures students’ comprehension and encourages critical thinking. New cognitive and didactic material is presented, along with new skills and features, to create a robust and innovative EMT training solution. Today, the AAOS suite of EMS educational resources, from first aid and CPR to critical care transport, is the gold standard in training programs by offering exceptional content and instructional resources that meet the diverse needs of today’s educators and students. Current State-of-the-Art Medical Content The Eleventh Edition aligns with current medical standards―from PHTLS to NASEMSO―and incorporates evidence-based medical concepts to ensure students and instructors have accurate, insightful interpretation of medical science as it applies to prehospital medicine today. 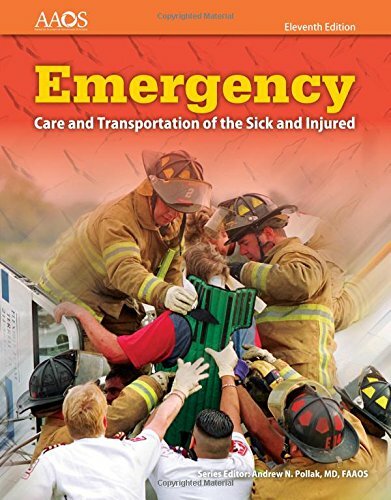 Application to Real-World EMS Through evolving patient case studies in each chapter, the Eleventh Edition gives students real-world context to apply the knowledge gained in the chapter, clarifying how the information is used to care for patients in the field, and pushing students to engage in critical thinking and discussion. A Foundation for Life The Eleventh Edition is built on the premise that students need a solid foundation in the basics and then appropriate reinforcement. The Eleventh Edition provides students with a comprehensive understanding of anatomy, physiology, pathophysiology, and medical terminology. Concepts are briefly reviewed within related subsequent chapters, solidifying the foundational knowledge and offering a context when studying specific emergencies. Patient Assessment, a critical topic, is presented as a single, comprehensive chapter, to ensure students understand patient assessment as a single, integrated process―the way providers actually practice it in the field. Core concepts of Patient Assessment are reinforced in clinical chapters, where the unique aspects of the illness or injury are highlighted.